Helping people see and understand data. For forty years, consumers and businesses have had access to databases and spreadsheets filled with information... and for forty years, consumers and businesses have struggled with turning that information into meaningful insight. Organizations are struggling under the weight of inflexible, manual reporting tools that require an army of engineers to implement and maintain. Analysts and front line employees sit waiting in queues for their answers. 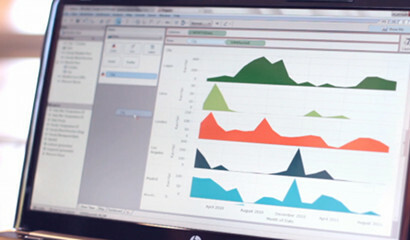 Tableau Software utilizes revolutionary new technology that allows anyone to connect to a data set and drag-and-drop to create beautiful and meaningful visual reports. Training is available online and for free; implementations across even large organizations can be accomplished in a tenth of the time of normal business intelligence software. Perhaps most importantly, now anyone can empower themselves to answer their own questions at the speed of thought. With Tableau, there is no scripting or technical knowledge required, just connect, drag and drop. Watch the video to see how. We produce ten times the analysis in half the time, with half the staff. Don't just take our word for what the Tableau experience is like... click on the image at the right for a live and interactive example of a Tableau dashboard. Click and drag to interact with the visualization and change it. This dashboard shows the story of the 2005 hurricane season over the Atlantic ocean. Tableau allows almost anyone to create visual stories like this that can help cross the chasm between big data and big insight. Click on the image to interact and see for yourself. Download a free trial today and see how Tableau can help you see and understand your data.